Medicine has long enjoyed Thai secrets, which in practice have a positive trend. The best-known remedy is the mushroom Lingzhi, Reishi mushroom also known as "Mushroom of Immortality" or Ganoderma. It is rich in amino acids, proteins, B3, B5 vitamins, C and D, and minerals (calcium, phosphorous, iron). 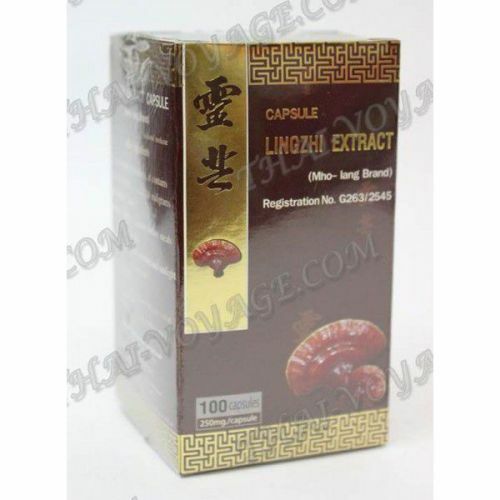 Do you know when and what used Lingzhi capsules? - To enhance immunity, and thereby improve their health. - Reduce the allergic reaction, even in chronic stages. - Improve and strengthen the nervous system and mental (passes insomnia and depression, sleep becomes strong, especially improving the condition in menopause). - Speed ​​up the metabolism, so many say weight loss. - When you pursue constant fatigue. Eating Lingzhi capsule, the body takes courage, and fatigue is gone forever and permanently. - Reduce the level of blood sugar. - Rejuvenated inside and out. - To protect the body from harmful toxins. How it affects Lingzhi mushroom (Ganoderma Reishi) cancer? Due to its healing composition, which includes a delta-beta polyglucans markedly slows tumor growth is eliminated to minimize the occurrence metostazov. Ergosterol (polysaccharides and fatty substances) provoke regression of both malignant and benign tumors. The body begins to absorb more oxygen, which leads to the normalization of the general condition. Lingzhi good drink for the prevention of cancer. How should I use Reishi mushroom capsules? Before meals for one or two capsules. The course is 3-4 weeks. Contraindications: low blood pressure, individual intolerance, pregnancy and lactation (advisable to consult with your doctor). In ischemic stroke drug can be taken at once, and in hemorrhagic - 4-6 months after stroke. Capsules Lingzhi Kongka Herb have 100 pieces in the package. Strengthen your body with Lingzhi, because it is so easy and safe! Do not let the disease to invade your life!